Krabbe disease (KD) (also known as globoid cell leukodystrophy or galactosylceramide lipidosis) is a rare and often fatal lysosomal storage disease that results in progressive damage to the nervous system. KD involves dysfunctional metabolism of sphingolipids and is inherited in an autosomal recessive pattern. The disease is named after the Danish neurologist Knud Krabbe (1885–1965). 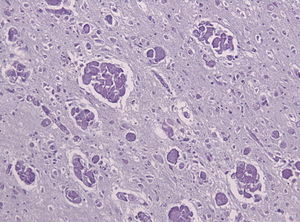 A histopathology slide of a brain with Krabbe disease showing giant cells with PAS stain inclusions ("globoid cells") within astrocytic gliosis and loss of myelinated fibers. Parents who are heterozygous (only one copy) for the mutation to the GALC gene. Infants with Krabbe disease are normal at birth. Symptoms begin between the ages of 3 and 6 months with irritability, fevers, limb stiffness, seizures, feeding difficulties, vomiting, and slowing of mental and motor development. In the first stages of the disease, doctors often mistake the symptoms for those of cerebral palsy. Other symptoms include muscle weakness, spasticity, deafness, optic atrophy, optic nerve enlargement, blindness, paralysis, and difficulty when swallowing. Prolonged weight loss may also occur. Juvenile and adult-onset cases of Krabbe disease also occur, which have similar symptoms but slower progression. 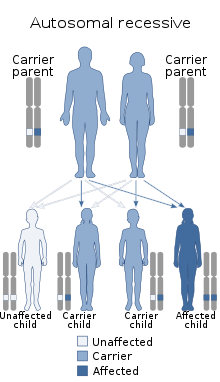 Krabbe disease is caused by mutations in the GALC gene located on chromosome 14 (14q31), which is inherited in an autosomal recessive manner. Mutations in the GALC gene cause a deficiency of an enzyme called galactosylceramidase. In rare cases, it may be caused by a lack of active saposin A (a derivative of prosaposin). The buildup of unmetabolized lipids adversely affects the growth of the nerve's protective myelin sheath (the covering that insulates many nerves) resulting in demyelination and severe progressive degeneration of motor skills. As part of a group of disorders known as leukodystrophies, Krabbe disease results from the imperfect growth and development of myelin. GALC deficiency also results in a build-up of a glycosphingolipid called psychosine, which is toxic to oligodendrocytes, a type of non-neuronal cell found in the nervous system, collectively termed neuroglia. The disease may be diagnosed by its characteristic grouping of certain cells (multinucleated globoid cells), nerve demyelination and degeneration, and destruction of brain cells. Special stains for myelin (e.g., luxol fast blue) may be used to aid diagnosis. New York, Missouri and Kentucky include Krabbe in the newborn screening panel. Indiana will start screening in 2020. Although there is no known cure for Krabbe disease, bone marrow transplantation has been shown to benefit cases early in the course of the disease. Generally, treatment for the disorder is symptomatic and supportive. Physical therapy may help maintain or increase muscle tone and circulation. Cord blood transplants from unrelated donors have been successful in stopping the disease as long as they are given before overt symptoms appear. In infantile Krabbe disease, death usually occurs in early childhood. A 2011 study found one, two, and three year survival rates of 60%, 26%, and 14%, respectively. A few survived for longer. Patients with late-onset Krabbe disease tend to have a slower progression of the disease and live significantly longer. Krabbe disease occurs in about one in 100,000 births. A higher incidence, about six in 1,000, has been reported in certain communities in Israel. Scandinavian countries report incidence rates of one in 50,000 births. Former Buffalo Bills quarterback Jim Kelly has been a leader in gaining recognition and research funding for Krabbe disease, following the diagnosis of his son, Hunter, in 1997. Hunter Kelly died of the disease on August 5, 2005, at the age of 8. Cove Ellis is a child from Georgia, United States, that was diagnosed with the disease in early 2016. Cove's family, along with her community, have worked to raise awareness of the disease and helped pass Cove's Law. This law allows parents the option to have prenatal screening for the disease which can potentially save the child. Krabbe disease may also be found in cats and in dogs, particularly the West Highland White Terrier and Cairn Terriers. The disease may also be found in dolphins. ^ a b c d e Langan, Thomas J (23 November 2016). "Krabbe disease". UpToDate. Retrieved 18 October 2018. ^ a b Duffner, Patricia K.; Barczykowski, Amy; Jalal, Kabir; Yan, Li; Kay, Denise M.; Carter, Randy L. (September 2011). "Early Infantile Krabbe Disease: Results of the World-Wide Krabbe Registry". Pediatric Neurology. 45 (3): 141–148. doi:10.1016/j.pediatrneurol.2011.05.007. PMID 21824559. ^ Li, Y; Sands, MS (November 2014). "Experimental therapies in the murine model of globoid cell leukodystrophy". Pediatric Neurology (Review). 51 (5): 600–6. doi:10.1016/j.pediatrneurol.2014.08.003. PMC 4252788. PMID 25240259. ^ synd/1457 at Who Named It? ^ Hussain, S. A.; Zimmerman, H. H.; Abdul-Rahman, O. A.; Hussaini, S. M.; Parker, C. C.; Khan, M. (May 2011). "Optic Nerve Enlargement in Krabbe Disease: A Pathophysiologic and Clinical Perspective". Journal of Child Neurology. 26 (5): 642–644. doi:10.1177/0883073810387929. PMID 21285037. ^ Cannizzaro, L.A. (1994). "Regional mapping of the human galactocerebrosidase gene (GALC) to 14q31 by in situ hybridization". Cytogenetic and Genome Research. 66 (4): 244–245. doi:10.1159/000133703. PMID 8162701. ^ "Krabbe disease". National Institutes of Health. ^ Kohlschütter, A (2013). Lysosomal leukodystrophies: Krabbe disease and metachromatic leukodystrophy. Handbook of Clinical Neurology. 113. pp. 1611–18. doi:10.1016/B978-0-444-59565-2.00029-0. ISBN 9780444595652. PMID 23622382. ^ Duffner, Patricia K.; Caggana, Michele; Orsini, Joseph J.; Wenger, David A.; Patterson, Marc C.; Crosley, Carl J.; Kurtzberg, Joanne; Arnold, Georgianne L.; Escolar, Maria L. (2009-04-01). "Newborn Screening for Krabbe Disease: the New York State Model". Pediatric Neurology. 40 (4): 245–252. doi:10.1016/j.pediatrneurol.2008.11.010. PMID 19302934. ^ "unbs_state - Hunter's Hope Foundation". www.huntershope.org. Retrieved 2016-11-14. ^ Runevitch, Jennie. "Bryce's Battle: Family gets law change after deadly diagnosis". WTHR. ^ Escolar ML, Poe MD, Provenzale JM, Richards KC, Allison J, Wood S, Wenger DA, Pietryga D, Wall D, Champagne M, Morse R, Krivit W, Kurtzberg J (2005). "Transplantation of Umbilical-Cord Blood in Babies with Infantile Krabbe's Disease". New England Journal of Medicine. 352 (20): 2069–2081. doi:10.1056/NEJMoa042604. ISSN 0028-4793. OCLC 206940639. PMID 15901860. BL Shelfmark 6084.000000. ^ a b "Krabbe disease". Genetics Home Reference. United States National Library of Medicine. 2008-05-02. Retrieved 2008-05-07. ^ Zlotogora J (1985). "Krabbe disease: Increased incidence in a highly inbred community". American Journal of Medical Genetics. 21 (4): 765–770. doi:10.1002/ajmg.1320210420. PMID 4025402. ^ Miller, Andy (March 18, 2017). "Georgia lawmakers considering bill on testing newborns for rare genetic disorder". Athens Banner-Herald. Athens Banner-Herald. Retrieved 25 March 2017. ^ Salvadori C, Modenato M, Corlazzoli DS, Arispici M, Cantile C (May 2005). "Clinicopathological features of globoid cell leucodystrophy in cats". J. Comp. Pathol. 132 (4): 350–6. doi:10.1016/j.jcpa.2004.12.001. PMID 15893994. ^ Capucchio MT, Prunotto M, Lotti D, Valazza A, Galloni M, Dore B, Pregel P, Amedeo S, Catalano D, Cornaglia E, Schiffer D (2008). "Krabbe's disease in two West Highland White terriers". Clin. Neuropathol. 27 (5): 295–301. doi:10.5414/npp27295. PMID 18808060. This article incorporates public domain text from the United States National Library of Medicine and the National Institute of Neurological Disorders and Stroke.